Subtropical rainforest in the north, alpine meadows and snowfields in the south, semi-arid desert in the west — these are the extremes of the natural environment of the Murray–Darling Basin. The term ‘environment’ is used in many ways, so in this section, the term ‘bioregion’ will be used. The Australian and state governments have adopted a bioregional framework to describe the land that contains the natural resources that they manage. The framework provides a common language for all to use, because the mulga lands or riverine plains, for example, don’t stop at the state border. In Australia, there are 89 bioregions. Bioregions are large, geographically distinct areas of land with common characteristics such as geology, landform patterns, climate, ecological features and plant and animal communities. 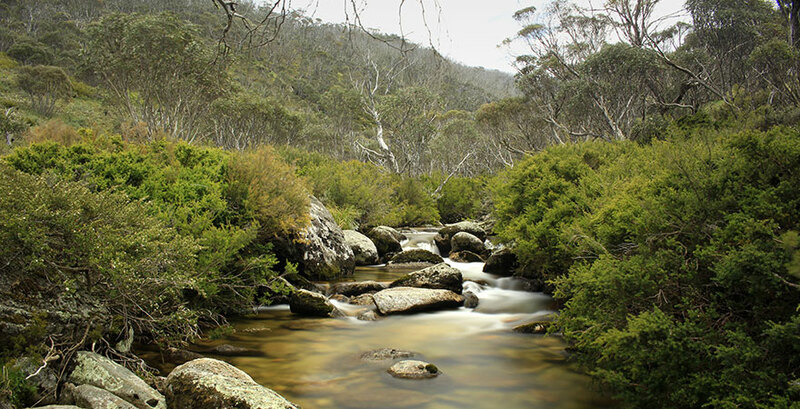 Dead Horse Creek in Kosciuszko National Park, New South Wales. There are about 15 bioregions partly or wholly in the Basin, including the mulga lands, Darling riverine plains, Murray–Darling depression, Riverina, New South Wales south-western slopes and Australian Alps bioregions. These bioregions are divided into 419 subregions, which are differentiated on more specific aspects of geology, vegetation and other features that influence major regional ecosystems. Within each subregion there are thousands of ecosystems. The 23 rivers and more than 30,000 wetlands of the Basin support a vast array of plants and animals in ecosystems that depend on a regular or intermittent supply of water. These water-dependent environments have evolved to function in the extremes that characterise the recent Australian climate — drought and flood, heat and cold. From rushing mountain streams to steadily flowing rivers, from alpine bogs to still billabongs on hot dry plains, there are countless types of different ecosystems in the Basin. Some of these are unique to Australia and support rare and endangered species or provide seasonal habitats for migratory birds. The rivers, wetlands and floodplains play an important role in providing clean water to natural and created environments that depend on water, as well as to communities and agriculture. The Basin needs to have rivers with regular flows of variable volume to transport sediment, salt and nutrients through the system and out to sea. A certain amount of flooding is required so that floodplains receive water; importantly, this flooding also ensures that wetland plants can 'filter' the water by extracting carbon and nutrients, for the benefit of plants and aquatic animal species and to provide downstream environments and water users with clean water.